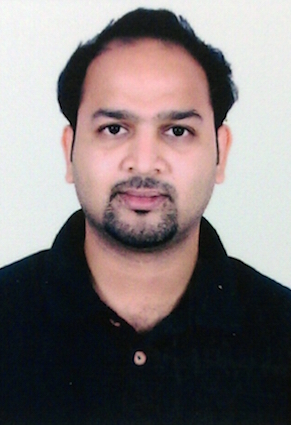 Dr Kamlesh Pawar completed his PhD in Electrical and Computer System Engineering on the development of novel imaging methodologies and reconstruction methods for accelerated MR imaging, jointly conferred by IIT Bombay (India) and Monash University (Australia). He was offered Tata Consultancy Services (TCS) Research Scholar Fellowship for his PhD. Dr Pawar's passion lies in development of novel imaging technologies. His expertise include MR Physics, MR Pulse Sequence Design and MR Image Reconstruction. He has experience in both Academia and Industry. His Industry experience includes, implementation of computer vision and Image processing algorithms on SIMD embedded processor and development of Instruction set architecture for SIMD image processor. At MBI, he is contributing on the development of quantitative imaging, accelerated Imaging and motion correction strategies for MR imaging. 2. K. Pawar, G. F. Egan and J. Zhang, "Accelerating k-t sparse using k-space aliasing for dynamic MRI imaging," Proceedings of 35th Annual International Conference of IEEE Engineering in Medicine and Biology, Osaka, Japan, July 2013. 3. K. Pawar, A. Arunachalam, G. F. Egan and J. Zhang, "Noiselet Encoded Compressive Sensing Parallel MRI," Proceedings of the 10th IASTED International conference on Biomedical Engineering and IEEE EMBS (Acta Press), Innsbruck, Austria, Feb 2013. 4. K. Pawar and A. Arunachalam, "Simultaneous Image and K-space Domain Aliasing for Accelerating Dynamic MRI Scans," Proceedings of the 20th Annual Meeting of ISMRM, Melbourne, Australia, 2012. 1. Vision P Processor - Cadence Solution to Automotive Industry at TECCI-2016, Noida, India, Sep 2016. 2. Real time Face Detection using Xtensa Imaging Technology at TECCI-2015 (Technical Conference of Cadence India), Noida, India. June 2015. 3. Distributed Compressive Sensing MRI using noiselet encoding at 5th Asia Pacific NMR Sympoysium -2013, Brisbane, Australia, Oct 2013.